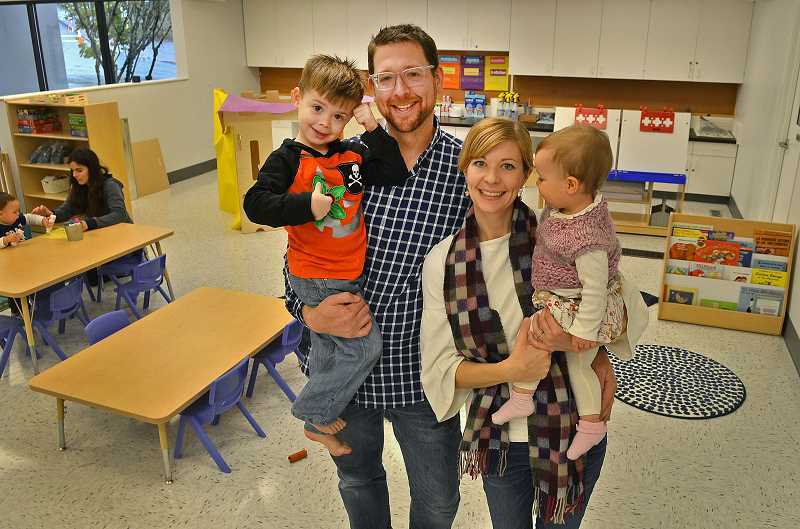 Atlas Immersion Academy, a Spanish immersion childcare center, has opened in West Linn. A 3-year-old sat down during his first day at Atlas Immersion Academy to do a puzzle in Spanish with his teacher — he had never before been exposed to the foreign language. "Most of our kids who come to our language immersion programs do not have a foreign language or a second language in the home. Most of them speak English at home with their families," said Dory Hobbs, co-owner of Atlas. "There's been an increased awareness among parents and a lot of research to show there are benefits for brain development in learning a second language at this age and it's something that comes naturally and easy to kids." Atlas — which officially opened Monday Oct. 23 at 4975 S.W. Willamette Falls Drive in West Linn — is a Spanish immersion childcare center that provides childcare for three-month olds to preschool-aged children, teaching them through structured and unstructured activities in Spanish. Hobbs said children learn to pick up on the language through rituals and routines. "They're gonna learn that they see a cat and they don't immediately just think cat, they have that flexibility in their brain to know gato — (Spanish for cat) — and cat," Dory said. "If down the road they want to pick up Mandarin or they want to learn Russian, they're not stuck on this idea that a cat is only a cat, they're flexible in the way that they think about language and how they attach that to actual things." Dory added that teachers in language immersion programs want to make sure they're not trying to ask children to do something that's not in their developmental ability. "Our curriculum introduces the kids to new concepts, new activities and fun things they enjoy already in developmentally appropriate ways through another language," Dory said. Opening Atlas with her husband Jarod in West Linn wasn't Hobbs' first experience with immersion programs. Being fluent in French, she and Jarod have two French immersion childcare centers in Southeast Portland. "There's this strong awareness that no matter the language, that it's a benefit for your child's brain development and obviously the practical skills down the road," Dory said, adding that she and Jarod speak French in their home to immerse their four children in the same practice. "We definitely see our children's French language ability as their second language, but hopefully not their last," Dory said. "We knew that when we started Atlas, we wanted there to be a continuation in our own and other kids' education. Learning language is kind of like a sport. You can't not play tennis for 10 years and expect to pick up a racket and be right where you were when you left off. You need to maintain it if you really want to keep that fluency." And this was a passion they were eager to share with the greater Portland community. The couple eventually wants to add an after school program for children in elementary school, particularly because some West Linn-Wilsonville primary schools already have dual language immersion programs. "After looking around at available childcare options, it looked like West Linn was underserved and we didn't see any other language immersion programs for early childhood age (children)," said Dory, adding that she saw the same need for Wilsonville and other surrounding communities, who are welcome at Atlas. "Knowing there is the dual immersion Spanish track in elementary schools, we thought that would just be a great opportunity for people in the West Linn community." Atlas is open from 7:30 a.m. to 6 p.m. Monday through Friday. Parents can sign their children up for childcare from two to five days a week. Dory and Jarod are currently holding formal story time with an open house Saturday Nov. 4 at 10 a.m. and Wednesday Nov. 8 at 6 p.m. to increase awareness of the new childcare center. The couple said people are able to stop by Monday to Friday from 10 a.m. to 6 p.m. If parents are interested, contact them to set up a tour at [email protected] or 971-238-9838.